Universal pen for overhead projectors and almost all surfaces CDs DVDs etc. Dry safe feature allows for several days of cap-off time without drying up. * Permanent neutral-smelling ink is waterproof and smudge-proof. 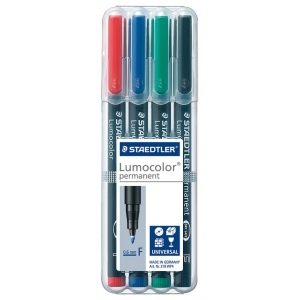 * Brilliant lightfast colors dry in seconds making these markers ideal for left-handed users. 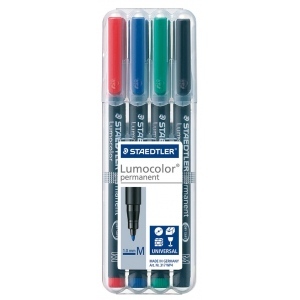 * Set contains 1 each of red blue green and black medium point markers.